• A well-trained and well-educated workforce: We have an abundance of the top educational institutions and comprehensive workforce training programs that are in place throughout the state. • A predictable business environment: The current administration has updated Rhode Island’s regulatory and tax policies, removing red tape to create an ideal environment for new and established companies. • Available and affordable housing: The opportunities for housing in Rhode Island are abundant, and the affordability index—when compared to major cities like Boston and New York—is important, especially for young people just leaving college and families that are starting off. • Transportation and infrastructure: It’s easy to get from one place to another here. When you consider the traffic congestion of some of Rhode Island’s competing and surrounding areas, we’re much more favorable when it comes to transportation and commute times. • Technology and utilities: For certain industries, utilities and energy supply are of paramount importance, especially for those companies that operate in the industrial parks in Cranston, Woonsocket or Quonset. Finally, whether in life or at work, there are always going to be challenges along the way. It’s important to be a problem solver and to persist through setbacks. All great entrepreneurs have worked through setbacks, and it seems perseverance is their common theme. 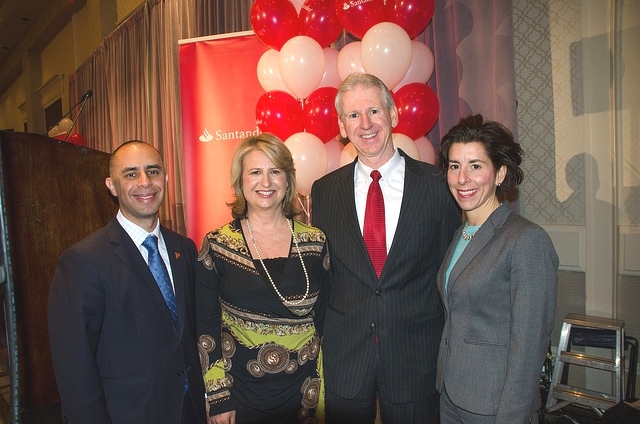 On March 21, 2018, Santander Bank and the Greater Providence Chamber of Commerce will host the Santander Economic Outlook Breakfast, to be hosted by Gov. Gina M. Raimondo and focused on the Providence-area economy. To secure a spot at the breakfast, kindly register by Friday, March 16. Admission is free.